Epithelial tissue – one of the most common in the human body. It covers the whole body, forming together with the dermis skin lining the hollow organs of the gastrointestinal tract, urinary and genital tract. One of its main features – a permanent renewal of cellular structure due to the continuous reproduction of cells of the basal (deepest) layer. Frequent division of cell nuclei leads to an accumulation of errors and mutations, which in some cases is the cause of malignant transformation. 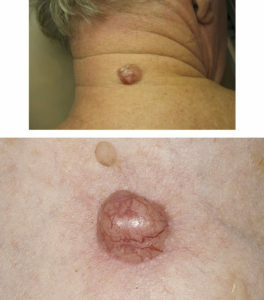 Basal cell carcinomas (basal cell cancer, basal cell carcinoma , basal cell epithelioma) – a cancerous tumor formed from the basal epithelial cell layer. Basal cell carcinoma is known to mankind since ancient times: modern researchers have found signs of it in Egyptian mummies and human remains that are aged for at least two millennia. The first detailed description of the tumors was done in the mid-19th century and at the beginning of the 20 th scientists proved its epithelial origin. The reason for this interest in the basal cell carcinoma – is its broadest distribution, it is considered one of the most common tumors in humans. The incidence of basal cell carcinoma in our country is 270 cases per 100 000 people, and is second only to lung cancer in frequency. To date, there is no single answer that leads to cancerous degeneration of normal cells. cell division errors – is uncommon in living tissues, especially intensively growing. However, in the body there is an effective system to prevent cellular atypia: T lymphocytes, according to their maturation learn to distinguish between normal healthy cells from the modified and destroy the past. Consequently, the occurrence of basal cell carcinoma – a two-way process: on the one hand are all reasons genome damaging the cells, on the other – lack of immune protection. These factors combined with congenital predisposition and inefficient T-cell immunity leading to degeneration of the cancer cells of the basal layer of the epidermis. They lose touch with other epithelial cells acquire the ability to divide indefinitely, they synthesize unusual proteins and can no longer perform its normal functions. carcinoma cells release substances that promote the growth of new blood vessels that will supply the sprawling tissue. Basal cell carcinoma – a slow growing tumor with a relatively benign course. Her cells divide slower than normal epithelial cells, many of them die than usual due to the small size of the tumors. However, basal cell carcinoma, like all cancers, is able to grow into the adjacent tissue (fascia, muscles, bones) and metastasize. What types of tumors are? bazalnoploskokletochnaya bazalioma with keratinization – part of the cells in the tumor is completely filled with a dense protein keratin and die. T1 – basal cell carcinoma spreads over the whole thickness of the epidermis and dermis can grasp, but it does not exceed 2 cm Simultaneously with it the patient revealed no more than 2 of high risk factors;. T4 – a tumor grows in the bones of the skeleton, or cranial nerves. low differentiation (maturity) tumor cells. M1 – distant metastases is. 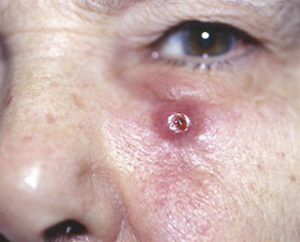 Thus, the initial stage of basal cell carcinoma is denoted as Tis N0 M0 – microscopic tumor size of only a few cells. In 90% of cases of basal cell skin cancer is localized on the head, along the lines of embryonic closure of skin flaps: nasolabial folds, the nose, on the border of the orbit of the eye and the ear. On body areas covered by the sun develops a tumor is much less and can be located on any part of the body, including the perianal folds, soles of the feet and palms. 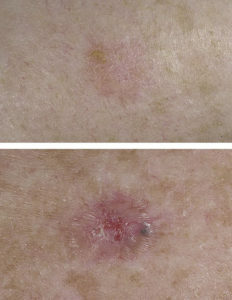 Basal cell carcinoma of the skin, patients notice the very early stages, but seek help only when a non-healing ulcer or tumor invasion into the underlying tissues. This is due to the slow growth of carcinoma, its seemingly harmless and the absence of pain, general malaise. The clinical picture of basal cell carcinoma depends on its type. Nodular form is considered a classic, because this type occurs 60-75% of all basaliomas. The skin appears tight knot with a diameter up to 5 mm, similar in appearance to a rounded drop of wax. It is different in color from the surrounding areas of the epidermis, its surface smooth, translucent. 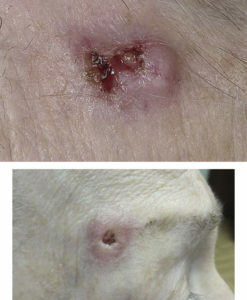 Through it shine red nodules – numerous blood vessels feeding the tumor. Education is growing very slowly, after a few years, it has reached 1-2 cm in diameter. Fast growth rate occurs in people of old age, and in patients with a significant reduction of immune protection, in particular of T-cell (HIV-positive). If the tumor merge multiple nodes, then it becomes a rough edge, it protrudes in the form of a roller. Mid carcinomas frequently decomposes to form small bleeding ulcer, whose surface is covered by a dry crust. A similar process can be transformed into a variety of tumor ulcer. In this case, in place epithelioma formed ulcer 1 cm wide, funnel form, which is practically treatable and periodically bleeds. Sometimes ulcerative defect substantially destroys the structure of the face, especially if it is localized nearby orifices (nostril, external auditory canal, eye). Sometimes, basal cell carcinoma cells contain pigment dark brown or black – the melanin, which is partially or fully stain it. May be formed within the tumor cavity filled with a liquid or thick muddy mass – cyst. Superficial basal cell carcinoma – the most benign type of tumor with a favorable prognosis. The skin appears pink plaque diameter of from 1 to a few cm, the surface of which can be peeling, peel, and enhanced weakened portions pigmentation atrophy. Edge it does not protrude above the surface of the skin and is bordered by a chain of brilliant whitish bubbles. Externally carcinoma resembles psoriatic or fungal skin lesions that usually requires careful differential diagnosis. The tumor grows slowly over the years and can not be treated dermatological preparations. 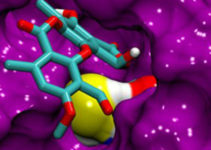 drug therapy – for the treatment of tumors administered drug that inhibits cell division (cytostatic). The method is suitable for patients with multiple carcinoma, which are not suitable radiation therapy and surgical removal. Forecast of basal cell carcinoma in most cases favorable, it has successfully cured the listed methods and rarely metastasizes. However, recurrent epithelioma – it is an alarming sign, which indicates a high risk of adverse outcome of disease. 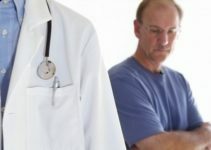 Difficult to treat tumors in elderly people and in those with persistent decline in immune defense.